The short answer is that certain pre-existing medical conditions are not compatible with scuba diving. In other words you may increase your risk of scuba diving related injuries if you have any pre-existing medical conditions. Dive instructors are not medical professionals. We can give advice and assure you that you can dive even if there is a ‘Yes’ on your form, we can’t clear the form for you. Luckily we have a doctor on the island who is qualified to clear you. Even if sometimes it may seem unnecessary to get medical clearance, it is paramount for diver safety. Common conditions include any that are medicated with prescription medication and child-hood Asthma. If there is uncertainty as to whether you have a medical condition or not, it is better to get medical clearance anyway. This is simply a terrible idea. While you can do this, I highly advise against it. You are not only putting yourself at risk. You are also jeopardising the health and safety of other divers, your instructor and potentially those who will have to wear the costs of rescue, transportation and treatment. Sadly, each year we learn of dive accidents and mishaps that occur to divers who have been less than honest in their medical statements. These are dive accidents that are easily preventable. If you hide/lie about your medical condition and something happens during your diving course, your insurance will not cover you. If an incident occurs during an Open Water dive, you may potentially put other people in the group at excess risk. When diving, the body needs to be able to deal with the changes in environment, hydrostatic pressure, gas volume changes and breathing increased gas density among others. A cleared medical form in combination with good diving insurance is the best way to start diving! At Sairee Cottage Diving we provide free diving insurance with all our courses. Medical clearance is not required for certified divers that are not participating in a diving course. The ‘why?’ is simple. Certified divers are responsible to know whether they are fit to dive. You can get a diving medical at home before you even leave for your holiday. Download the medical statement and take it to a doctor. Your comfort and safety are our primary concern. Especially in an uncertain situation it is far better to get peace of mind than take risks. 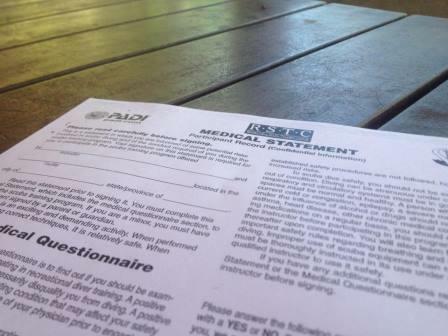 While you have the right to do what you want, please answer diver medical statements honestly. We happily arrange for you to see the doctor and even personally drive you down on our bike. This is because we want everyone to be as safe as possible.